Battersea Power Station is a decommissioned coal-fired power station, which is now being redeveloped to bring new homes, offices, shops, restaurants, bars, open space and more to Wandsworth, south London. Now owned by a consortium of Malaysian investors, the Grade II* listed building and the surrounding 42 acres are being gentrified through an eight phase development project. The first phase, Circus West Village, is already complete and now open to the public to eat, drink, shop, exercise and live. Situated on the south bank of the river by Chelsea Bridge, over 1000 people now live at Circus West Village, and 12 restaurants, bars and shops are open alongside a fitness studio and a hair salon. Circus West Village is accessible by river bus, as the new Battersea Power Station pier is serviced by MBNA Thames Clippers. Situated on the south bank of the River Thames, in Nine Elms, Battersea, an inner-city district of South West London, the building comprises two power stations, built in two stages in a single building. Battersea A Power Station was built in the 1930s and Battersea B Power Station to its east in the 1950s. They were built to a nearly identical design, providing the iconic four-chimney structure. The Power Station was decommissioned between 1975 and 1983 and remained empty until 2014. It was designated as a Grade II listed building in 1980. In 2007 its listed status was upgraded to Grade II*. The station is one of the world's largest brick buildings and notable for its original, lavish Art Deco interior fittings and decor. The structure remained largely unused for more than 30 years after its closure; in 2008 its condition was described as "very bad" by English Heritage, which included it in its Heritage at Risk Register. The site was also listed on the 2004 World Monuments Watch by the World Monuments Fund. Since the station's closure, redevelopment plans have been drawn up by successive site owners. In 2004, when a redevelopment project by Parkview International stalled, the site was sold to the administrators of Irish company Real Estate Opportunities (REO), who bought it for £400 million in November 2006 with plans to refurbish the station for public use and build 3,400 homes on the site. This plan fell through due to REO's debt being called in by the state-owned banks of the UK and Ireland. The site was again put up for sale in December 2011 through commercial estate agent Knight Frank. The combination of an existing debt burden of some £750 million, the need to make a £200 million contribution to an extension to the London Underground, requirements to fund conservation of the derelict power station shell, and the presence of a waste transfer station and cement plant on the river frontage made commercial development of the site a significant challenge. Until the late 1930s electricity was supplied by municipal undertakings. These were small power companies that built power stations dedicated to a single industry or group of factories, and sold any excess electricity to the public. These companies used widely differing standards of voltage and frequency. In 1925 Parliament decided that the power grid should be a single system with uniform standards and under public ownership. Several of the private power companies reacted to the proposal by forming the London Power Company (LPC). They planned to heed parliament's recommendations and build a small number of very large stations. The London Power Company's first of these super power stations was planned for the Battersea area, on the south bank of the River Thames in London. The proposal was made in 1927, for a station built in two stages and capable of generating 400 megawatts (MW) of electricity when complete. The site chosen was a 15-acre (61,000 m2) plot of land which had been the site of the reservoirs for the former Southwark and Vauxhall Waterworks Company. The site was chosen for its proximity to the River Thames for cooling water and coal delivery, and because it was in the heart of London, the station's immediate supply area. The proposal sparked protests from those who felt that the building would be too large and would be an eyesore, as well as worries about the pollution damaging local buildings, parks and even paintings in the nearby Tate Gallery. The company addressed the former concern by hiring Sir Giles Gilbert Scott to design the building's exterior. He was a distinguished architect and industrial designer, famous for his designs for the red telephone box and Liverpool Anglican Cathedral. 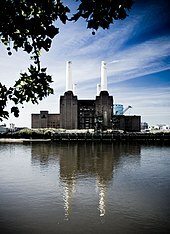 He subsequently designed another London power station, Bankside, which now houses Tate Modern art gallery. The pollution issue was resolved by granting permission for the station on the condition that its emissions were to be treated, to ensure they were "clean and smokeless". Construction of the first phase (the A Station) began in March 1929. The main building work was carried out by John Mowlem & Co, and the structural steelwork erection carried out by Sir William Arrol & Co. Other contractors were employed for specialist tasks. Most of the electrical equipment, including the steam turbine turbo generators, was produced by Metropolitan-Vickers in Trafford Park, Manchester. The building of the steel frame began in October 1930. Once completed, the construction of the brick cladding began, in March 1931. Until the construction of the B Station, the eastern wall of the boiler house was clad in corrugated metal sheeting as a temporary enclosure. The A Station first generated electricity in 1933, but was not completed until 1935. The total cost of its construction was £2,141,550. Between construction beginning in 1929 and 1933, there were six fatal and 121 non-fatal accidents on the site. The A Station had been operated by the London Power Company, but by the time the B Station was completed, the UK's electric supply industry had been nationalised, and ownership of the two stations had passed into the hands of the British Electricity Authority in 1948. On 20 April 1964, the power station was the site of a fire that caused power failures throughout London, including at the BBC Television Centre, which was due to launch BBC Two that night. The launch was delayed until the following day at 11 am. Both of the stations were designed by a team of architects and engineers. The team was headed by Dr. Leonard Pearce, the chief engineer of the London Power Company, but a number of other notable engineers were also involved, including Henry Newmarch Allott, and T. P. O'Sullivan who was later responsible for the Assembly Hall at Filton. J. Theo Halliday was employed as architect, with Halliday & Agate Co. employed as a sub-consultant. Halliday was responsible for the supervision and execution of the appearance of the exterior and interior of the building. Architect Sir Giles Gilbert Scott was involved in the project much later on, consulted to appease public reaction, and referred to in the press as "architect of the exterior". The station was designed in the brick-cathedral style of power station design, which was popular at the time. Battersea is one of a very small number of examples of this style of power station design still in existence in the UK, others being Uskmouth and Bankside. The station's design proved popular straightaway, and was described as a "temple of power", which ranked equal with St Paul's Cathedral as a London landmark. In a 1939 survey by The Architectural Review a panel of celebrities ranked it as their second favourite modern building. The A Station's control room was given many Art Deco fittings by architect Halliday. Italian marble was used in the turbine hall, and polished parquet floors and wrought-iron staircases were used throughout. Owing to a lack of available money following the Second World War, the interior of the B Station was not given the same treatment, and instead the fittings were made from stainless steel. Each of the two connected stations consists of a long boiler house with a chimney at each end and an adjacent turbine hall. This makes a single main building which is of steel frame construction with brick cladding, similar to the skyscrapers built in the United States around the same time. The station is the largest brick structure in Europe. The building's gross dimensions measure 160 metres (520 ft) by 170 metres (560 ft), with the roof of the boiler house standing at over 50 metres (160 ft). Each of the four chimneys is made from concrete and stands 103 metres (338 ft) tall with a base diameter of 8.5 metres (28 ft) tapering to 6.7 metres (22 ft) at the top. The station also had jetty facilities for unloading coal, a coal sorting and storage area, control rooms and an administration block. The A Station generated electricity using three turbo alternators; two 69 megawatt (MW) Metropolitan-Vickers British Thomson-Houston sets, and one 105 MW Metropolitan-Vickers set, totalling 243 MW. At the time of its commissioning, the 105 MW generating set was the largest in Europe. The B Station also had three turbo alternators, all made by Metropolitan-Vickers. This consisted of two units which used 16 MW high-pressure units exhausting to a 78 MW and associated with a 6 MW house alternator, giving these units a total rating of 100 MW. The third unit consisted of a 66 MW machine associated with a 6 MW house alternator, giving the unit a rating of 72 MW. Combined, these gave the B station a generating capacity of 260 MW, making the site's generating capacity 503 MW. All of the station's boilers were made by Babcock & Wilcox, fuelled by pulverised coal from pulverisers also built by Babcock & Wilcox. There were nine boilers in the A station and six in the B station. The B station's boilers were the largest ever built in the UK at that time. The B station also had the highest thermal efficiency of any power station in the country for the first twelve years of its operation. Coal was usually brought to the station by collier ships, and unloaded by cranes, which are still intact on the station's riverfront. The power station consumed over 1,000,000 tonnes of coal annually, mostly from pits in South Wales and North East England, delivered by coastal collier ships. They were "flat-irons" with a low-profile superstructure and fold-down funnels and masts to fit under the Thames' bridges above the Pool of London. The LPC and its nationalised successors owned and operated several "flat-irons" for the service. Coal was usually delivered to the jetty where two cranes, capable of unloading two ships at a time at a rate of 480 tonnes an hour, offloaded coal. Some coal was delivered by rail to the east of the station from the Brighton Main Line which passes nearby. A conveyor belt system moved the coal to a storage area or directly to the station's boiler rooms. The conveyor belt system consisted of a series of bridges connected by towers. The storage area was a large concrete box capable of holding 75,000 tonnes of coal. It had an overhead gantry and a conveyor belt attached to the conveyor belt system for moving coal to the boiler rooms. Water, essential to a thermal power station, is used to condense steam from the steam turbines before it is returned to the boiler. Water cycled through the power station's systems was taken from the Thames. The station could extract an average of 1.5 gigalitres (340,000,000 imperial gallons) of water from the river each day. Once the water had been through the station's systems, it was cooled and discharged into the river. After the end of World War II, the London Power Company used the waste heat to supply the Pimlico District Heating Undertaking. The reduction of sulphur emissions was an important factor from when the station was in the design stages, as it was one of the main concerns of the protesters. The London Power Company developed an experimental technique for washing flue gases in 1925. It used water and alkaline sprays over scrubbers of steel and timber in flue ducts. The gases were subject to continuous washing, and in the presence of the catalyst iron oxide, sulphur dioxide was converted into sulphuric acid. Battersea Power Station was one of the world's first commercial applications of this technique. This process was stopped in the B Station in the 1960s, when it was discovered that the discharge of these products into the Thames was more harmful than the gases would be to the atmosphere. Three years after the closure of the A Station, rumours began to circulate that the B Station would soon follow. A campaign was then launched to try to save the building as part of the national heritage. As a result, the station was declared a heritage site in 1980, when the Secretary of State for the Environment, Michael Heseltine, awarded the building Grade II listed status. (This was upgraded to Grade II* listed in 2007.) On 31 October 1983 production of electricity at Station B also ended, after nearly 30 years of operation. By then the B Station's generating capacity had fallen to 146 MW. The closure of the two stations was put down largely to the generating equipment becoming outdated, and the preferred choice of fuel for electricity generation shifting from coal toward oil, gas and nuclear power. Following the station's closure, the Central Electricity Generating Board had planned to demolish the station and sell the land for housing, but because of the building's then Grade II listed status, they had to pay the high cost of preserving the building. In 1983 they held a competition for ideas on the redevelopment of the site. It was won by a consortium led by developer David Roche and which included John Broome, owner of Alton Towers Ltd. This consortium proposed an indoor theme park, with shops and restaurants. At an estimated cost of £35 million, the scheme was risky and would require over 2 million visitors a year to make any profit. The scheme received planning approval in May 1986 and the site was purchased by John Broome for £1.5 million in 1987. Work on converting the site began the same year. In March 1990, the proposal was changed to a mixture of offices, shops and a hotel. This proposal was granted planning permission in August 1990, despite opposition from 14 independent organisations, including English Heritage. Despite permission being granted, no further work took place on the site between 1990 and 1993. In 1993, the site and its outstanding debt of £70 million were bought from the Bank of America by Hong Kong-based development company, Parkview International, for £10 million. Following resolution of creditors' claims, it acquired the freehold title in May 1996. In November 1996 plans for the redevelopment of the site were submitted and outline consent was received in May 1997. Detailed consent for much of the site was granted in August 2000, and the rest in May 2001. The company received full possession of the site in 2003. Having purchased the site, Parkview started work on a £1.1 billion project to restore the building and to redevelop the site into a retail, housing and leisure complex. During the Parkview era several masterplans for the site were developed by various architects and subsequently discarded. One notable plan, called simply "The Power Station", was masterminded by architect Nicholas Grimshaw. The scheme proposed a shopping mall, with 40 to 50 restaurants, cafés and bars, 180 shops, as well as nightclubs, comedy venues and a cinema. Cosmopolitan shops would have been sited in the A Station's turbine hall, and label name shops in the B Station's turbine hall. The boiler house would have been glazed over and used as a public space for installations and exhibitions. A riverside walkway would also be created, running continuously along the riverside from Vauxhall to Battersea Park. 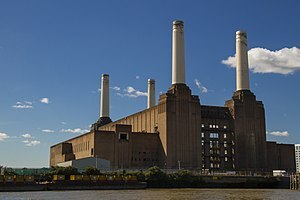 In 2005 Parkview, English Heritage and the London Borough of Wandsworth claimed that the reinforcement inside the chimneys was corroded and irreparable. Wandsworth Council granted permission for them to be demolished and rebuilt. However, the Twentieth Century Society, the World Monuments Fund and the Battersea Power Station Company Ltd commissioned an alternative engineers' report that claimed that the existing chimneys could be repaired. In response, Parkview claimed to have given a legally binding undertaking to the council to provide certainty that the chimneys will be replaced "like for like", in accordance with the requirements of English Heritage and the planning authorities. On 30 November 2006, it was announced that Real Estate Opportunities, led by Irish businessmen Richard Barrett and Johnny Ronan of Treasury Holdings, had purchased Battersea Power Station and the surrounding land for €532 million (£400 million). REO subsequently announced that the previous plan by Parkview had been dropped and that it had appointed the practice of the Uruguayan-born architect Rafael Viñoly of New York as the new master planner for the site. The centrepiece of this masterplan was a 980-foot-high "eco tower" that dwarfed the power station and was described by London's then mayor Boris Johnson as an "inverted toilet-roll holder". The tower was quickly dropped from the scheme. Jersey law firms, Ogier, Carey Olsen and Mourant Oxannes helped REO to raise funds for the new Battersea Power Station redevelopment. A proposed part of the regeneration is an extension of the London Underground to serve the area. Although the site is close to Battersea Park and Queenstown Road stations, trains from these stations to Victoria and Waterloo respectively are already heavily loaded. The proposed 2-mile tunnelled extension would branch from the Northern line at Kennington and travel west to Nine Elms and Battersea. The proposed extension would cost at least £500 million in 2008 terms. In June 2008 a consultation process was launched, which revealed that 66% of the general public were in favour of the plans. At an event at the station on 23 March 2009, it was announced that REO were to submit the planning application for their proposal to Wandsworth Council. "Lenders to the owner of Battersea Power Station in London waived a debt maturity deadline yesterday while talks with potential new equity partners for its redevelopment continued, a source close to the process told Reuters. AIM-listed Real Estate Opportunities is seeking a partner for the 5.5 billion pound ($9 billion) development, and its senior lenders Lloyds and Ireland's National Asset Management Agency have already extended a deadline once relating to the 400 million pounds REO paid for the site in 2006. 'The banks have nothing to gain by calling the debt in. Talks with new equity partners continue, and an announcement may come in the next few weeks,' the source said". In February 2012, Sir Terry Farrell's architectural firm put forward a proposal to convert the power station site into an "urban park" with an option to develop housing at a later date. In this vision, Farrells propose to demolish all but the central boiler hall and chimneys and display the switching equipment from the control rooms in 'pods'. However, this plan is unlikely to bear fruit due to the Grade 2 listing status of the site. On 9 November 2008, Chelsea F.C. 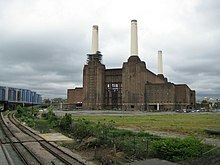 was reported to be considered moving to a new purpose built stadium at Battersea Power Station. The proposed stadium was to hold between 65,000 and 75,000 fans and feature a retractable roof. The proposals were designed by HOK Sport, the same company who designed Wembley Stadium. However, the Chelsea F.C. scheme was seriously in doubt due to concerns for the preservation of the site and the collapse of the REO scheme in late November 2011. Potential buyers were required to preserve the station's Grade II* listed four iconic chimneys and lime wash towers. Following the failure of the REO bid to develop the site, in February 2012, Battersea Power Station was put up for sale on the open market for the first time in its history. The sale was conducted by commercial estate agent Knight Frank on behalf of the site's creditors. In May 2012, several bids were received for the landmark site, which was put on the market after Nama and Lloyds Banking Group called in loans held by Treasury Holdings' Real Estate Opportunities (REO). Bids were received from Chelsea F.C. with other interested parties including a Malaysian interest, SP Setia, London & Regional, a company owned by the London-based Livingstone brothers and housebuilder Berkeley. If sold, the new owner would have to pay £500 million for the power station, including £325 million to cover the debts held by Nama and Lloyds, and a £100 million contribution to the Northern line extension. If the sale is unsuccessful, the agent would have a duty to maintain and preserve the site in line with its listed status. On 7 June 2012, Knight Frank announced that administrators Ernst & Young had entered into an exclusive agreement with Malaysian developers SP Setia and Sime Darby, who were given 28 days to conduct due diligence and agree the final terms of the deal. Completion of the sale to the Malaysian consortium took place in September 2012. The redevelopment of the site will use the existing Vinoly master plan which intends to position the Power Station as the central focus of the regenerated 40-acre site, housing a blend of shops, cafes, restaurants, art and leisure facilities, office space and residential accommodation. The plan includes the restoration of the historic Power Station itself, the creation of a new riverside park to the north of the Power Station and the creation of a new High Street which is designed to link the future entrance to Battersea Power Station tube station with the Power Station. The redevelopment is hoped to bring about the extension of the existing riverside walk and facilitate access directly from the Power Station to Battersea Park and Chelsea Bridge. In October 2013, Frank Gehry was appointed joint architect with Foster + Partners to design "Phase 3" of the scheme, which will provide "the gateway to the entire development and the new Northern line extension". Battersea Power Station has become an iconic structure, being featured in or used as a shooting location for many films, television programmes, music videos and video games. One of the station's earliest appearances on film was in Alfred Hitchcock's 1936 film Sabotage, which shows the station before the construction of the B station. The interior of the A station's control room was used for the "Find The Fish" segment of Monty Python's 1983 film The Meaning of Life. The station makes a brief appearance in The Beatles second film “Help! “ in 1965. It also appears during the first daylight attack on London sequence in the 1969 movie, Battle of Britain, in the movie as in real life used as a navigational landmark by the attacking Luftwaffe bombers. More recently in October 2007, the power station was used as a filming location for the Batman movie, The Dark Knight. The station's stripped, empty interior was used as a setting for a burnt out warehouse. A closeup of the station can be seen as stand-in for the exterior of a London railway station in Michael Radford's 1984 film Nineteen Eighty-Four. The station has appeared numerous times in the long-running British science fiction series Doctor Who. It appeared briefly in the story The Dalek Invasion of Earth in 1964, which saw the station in the 22nd century with two chimneys demolished, and a nearby nuclear reactor dome. 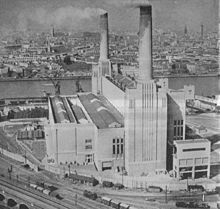 The Battersea Power Station Community Group think one of the main reasons for the power station's worldwide recognition is that it appeared on the cover of Pink Floyd's 1977 album Animals, on which it was photographed with the group's inflatable pink pig floating above it. The photographs were taken in early December 1976 and the inflatable pig was made by the German company Ballon Fabrik and Australian artist Jeffrey Shaw. The inflatable pig was tethered to one of the power station's southern chimneys, but broke loose from its moorings and, to the astonishment of pilots in approaching planes, drifted into the flight path of Heathrow Airport. Police helicopters tracked its course, until it landed in Kent. Video footage of the photoshoot was used in the promotional video for the song "Pigs on the Wing". The album was officially launched at an event at the power station. In recent years, the power station has been used for various sporting, cultural and political events. Since 22 August 2009, the station has been used as a venue on the Red Bull X-Fighters season. On 13 April 2010 the station was used as the venue for the launch of the Conservative Party's 2010 general election manifesto. 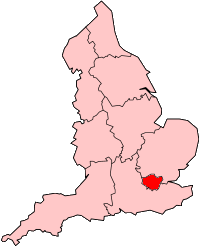 Between 6 and 7 May 2010, the station site was used by Sky News in their coverage of the election. ^ "Battersea Power Station". Battersea Power Station. Retrieved 24 September 2018. ^ "Battersea Power Station | Circus West Village". Battersea Power Station. Retrieved 24 September 2018. ^ "Boom Cycle". Boom Cycle. Retrieved 24 September 2018. ^ "Contact Us | Paul Edmonds". Paul Edmonds. Retrieved 24 September 2018. ^ Clippers, Thames. "Battersea Power Station Pier | MBNA Thames Clippers". www.thamesclippers.com. Retrieved 24 September 2018. 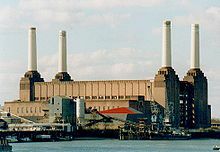 ^ "Malaysia's Sime Darby, SP Setia Set to Buy London's Battersea". The Wall Street Journal. 7 June 2012. ^ a b "BBC News". 5 September 2012. ^ "Watt a view! Inside the planned penthouse flats at Battersea Power Station where the most expensive will cost a cool £6MILLION each". Daily Mail. London. 10 January 2013. ^ Roland, Denise (14 January 2013). "Battersea Power Station flats snapped up". Daily Telegraph. London. ^ "Apple to create London home at Battersea Power Station". 28 September 2016. ^ "BATTERSEA POWER STATION", PAYE Stonework and Restoration, accessed 30 December 2018. ^ Historic England. "Battersea Power Station (1357620)". National Heritage List for England. Retrieved 10 December 2011. ^ Ackroyd, Peter (2008). Thames: The Biography. Knopf Doubleday Publishing Group. p. 216. The docks of the Thames were by far the largest in the world, now Battersea Power Station is one of the largest brick structures. ^ "History of the Construction". Battersea Power Station Community Group. Archived from the original on 20 January 2009. Retrieved 3 February 2009. ^ a b c d e f Booth, Robert (20 June 2008). "Latest plans for Battersea power station revealed". London: The Guardian. Retrieved 11 March 2009. ^ "World Monuments Fund – Battersea Power Station". ^ a b "Iconic landmark is sold for £400m". BBC News. 30 November 2006. Retrieved 30 November 2006. ^ Hatcher, David (12 November 2010). "REO's Battersea Power Station granted consent by Wandsworth". www.propertyweek.com. Retrieved 28 January 2011. ^ "Battersea Power Station in London on sale". BBC News. 24 February 2012. ^ "| Knight Frank". Search.knightfrank.com. Retrieved 27 March 2013. ^ Molloy, Thomas (3 September 2009). "REO searching for partner in Battersea power station revamp". Irish Independent. ^ Ruddick, Graham (20 August 2011). "REO seeks to sell 50pc stake in Battersea Power Station". The Daily Telegraph. London. ^ a b c d e f g h "History of the Construction". Battersea Power Station Community Group. Archived from the original on 20 January 2009. Retrieved 3 February 2009. ^ a b c d e f "Battersea Power Station". Archived from the original on 10 March 2012. Retrieved 8 March 2009. ^ a b c d e f g h i j "Putting Battersea on the map". Archived from the original on 10 March 2012. Retrieved 8 March 2009. ^ "Frequently Asked Questions". Battersea Power Station Community Group. 11 May 2000. Retrieved 9 March 2009. ^ Gilmour, J. (1 May 1933). "BATTERSEA POWER STATION (ACCIDENTS)". Hansard. Retrieved 2 September 2009. ^ "BBC2 opening night". Archived from the original on 10 October 2012. Retrieved 11 March 2009. ^ Heritage Protection Department (March 2007). "Utilities and communications buildings selection guide" (PDF). English Heritage. p. 10. Retrieved 7 September 2008. ^ CBLex (15 February 2008). "Shoreham power station" (ASPX). Retrieved 8 March 2009. ^ Rebecca Beveridge (2 November 2008). "Battersea Power Station – Fam Trip 2 November 2008" (PDF). Archived (PDF) from the original on 19 March 2009. Retrieved 10 March 2009. ^ "Turbine, Battersea Power Station, 31 January 1935" (ASP). Science and Society Picture Library. Retrieved 25 January 2011. ^ a b Anderson, James B (2008). Sommerville, Iain (ed.). "Ships built by the Burntisland Shipbuilding Company Ltd: arranged by date of launch". Welcome to Burntisland. Iain Sommerville. Archived from the original on 16 July 2011. Retrieved 15 June 2011. ^ a b "Heritage Building". Battersea Power Station Community Group. Archived from the original on 20 January 2009. Retrieved 3 February 2009. ^ a b c d Mr. Redmond (16 January 1984). "Coal-fired Power Stations". Hansard. Retrieved 1 September 2009. ^ Rory Olcayto (5 October 2007). "Battersea Power Station upgraded to grade II*". Archived from the original on 15 October 2007. Retrieved 10 October 2007. ^ "Brief history and introduction". Battersea Power Station Community Group. Archived from the original on 25 February 2009. Retrieved 10 March 2009. ^ "Power Plant Conversions, Museums & Historical Sites". 12 July 2003. Archived from the original on 18 July 2009. Retrieved 10 March 2009. ^ Lowe, Felix (20 June 2008). "Battersea Power Station: A timeline". London: The Daily Telegraph. Retrieved 15 March 2009. ^ a b c Jessica Cargill Thompson (19 September 2006). "Battersea Power Station". Retrieved 15 March 2009. ^ "Battersea Power Station Community Group". Archived from the original on 8 August 2008. Retrieved 3 August 2008. ^ Tom Houston. "Risky Buildings". Archived from the original on 28 August 2008. Retrieved 10 March 2009. ^ "Fears over power station chimneys". BBC News. 16 July 2005. Retrieved 10 March 2009. ^ "REO buys London's Battersea power station". RTÉ News. 30 November 2006. Retrieved 3 August 2008. ^ "Law firms help finance Battersea Power Station development". News.searchofficespace.com. 26 May 2011. Retrieved 27 March 2013. ^ a b c d Whitten, Nick (24 March 2009). "Battersea Power Station regeneration to go to planning". Archived from the original on 27 March 2009. Retrieved 24 March 2009. ^ a b Hatcher, David (12 November 2010). "REO's Battersea Power Station granted consent by Wandsworth". www.propertyweek.com. Retrieved 28 January 2011. ^ a b "New Battersea Power Station plans include office space". Officespacefinders.com. 14 February 2011. Archived from the original on 25 September 2013. Retrieved 27 March 2013. ^ Hudson, Clare (30 March 2011). "What will become of Battersea Power Station?". Retrieved 30 March 2011. ^ "Banks waive Battersea Power Station debt deadline". Reuters. 1 September 2011. ^ "Chelsea make offer to buy Battersea Power Station". BBC News. 4 May 2012. ^ "Battersea Power Station in London on sale". BBC News. 24 February 2012. Retrieved 27 March 2013. ^ "WilkinsonEyre and Purcell to Restore Grade II* Battersea Power Station, The Architects' Journal 30 May 2013". ^ Roland, Denise (14 January 2013). "Battersea Power Station flats snapped up". The Daily Telegraph. London. ^ "Detailed plans for power station approved". ^ "Daily Mail". London. 10 January 2013. ^ "Carillion chosen for Battersea Power Station £400m phase one for construction expertise". Construction News. 22 May 2013. Retrieved 9 November 2013. ^ "TFL". Archived from the original on 3 December 2013. ^ "Revealed: Apple to create stunning new London HQ at Battersea Power Station". 28 September 2016. Retrieved 28 September 2016. ^ Alfred Hitchcock – Director (1936). Sabotage. Event occurs at 01:50 – 02:15. Archived from the original on 9 May 2012. Retrieved 22 March 2009. ^ Terry Jones – Director (1983). Find the Fish. Retrieved 22 March 2009. ^ William Hartnell – actor (1964). The Dalek Invasion of Earth. Event occurs at 00:43 – 00:49. Archived from the original on 13 November 2010. Retrieved 22 March 2009. ^ a b "Pink Floyd". Battersea Power Station Community Group. Archived from the original on 21 September 2008. Retrieved 3 August 2008. ^ Pink Floyd (1977). Pig on the Wing. Retrieved 17 March 2009. ^ "Red Bull X-Fighters in London: Robbie Madison interview". The Daily Telegraph. London. 21 August 2009. Retrieved 23 August 2009. ^ "Manifesto Watch: Tory launch". BBC News. 13 April 2010. Archived from the original (STM) on 16 April 2010. Retrieved 8 May 2010. ^ McCabe, Maisie (7 May 2010). "Election coverage watched by almost ten million". Brand Republic. Retrieved 8 May 2010. 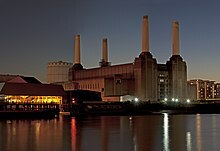 Wikimedia Commons has media related to Battersea Power Station. Historic England. "Grade II at the time of entry (Grade II* since 2007) (207028)". Images of England. This page was last edited on 11 April 2019, at 12:36 (UTC).